Obituary – Wood, Hayden (Mugler) « Perry High School Alumni Association, Inc. Band 50-54; Football Queen Business Manager 50-51; Wrestling Queen Attendant 52-53; Teen Town Council 52-53; Junior Play 52-53; Vice President of National Honor Society 52-53; Delegate to Girl’s State 52-53; President of Student Council 53-54; Football Queen 53-54. Hayden Mugler Wood died peacefully on Thursday, June 29 after a long battle with Alzheimer’s Disease. She was born to John Henry Mugler and Maxine Woodruff Mugler in Perry, Oklahoma on Christmas Day, December 25, 1935. She grew up on 30 acres where she enjoyed her horses and other outdoor activities. She attended Perry High School where she was elected Football Queen. 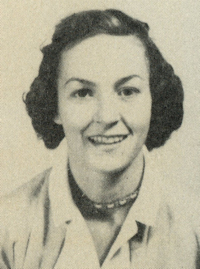 She attended the University of Oklahoma and was a member of Delta Delta Delta sorority. After OU, she worked at OU Medical Center. She met Chesley Wood in Oklahoma City where he was working for American Airlines, and they married in 1960, moving to Dallas and then to Austin, her home for the last fifty years. Hayden and Chesley have been active members of Westminster Presbyterian Church since 1969. Hayden was a founding member of the Assistance League of Austin, where for years she hosted the monthly Needlepoint Workshops at her home to make kits for patients at Seton Medical Center. She led her daughters Blue Bird and Camp Fire Girl troops, and was active in their schools. 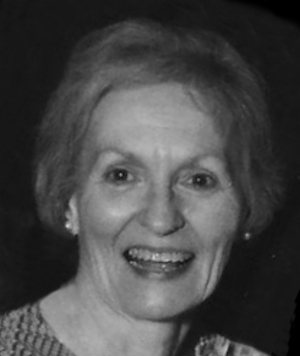 An avid reader, she loved politics and current events and could often be found in her garden. She will also be remembered for her love of cooking and the Christmas stollens she baked and shared with friends and neighbors every year. She is predeceased by her parents and her sister, Sally Mugler Carnes. She is survived by her beloved husband of 56 years, Chesley Kosub Wood and her daughters Shannon Wood Hagood (Greg) and Millay Wood Chappell (Bill), both of Atlanta, as well as grandchildren Matt, Will and Caroline Hagood and Finley and Sadie Chappell. A special thanks to Martha Bauman, Halcyon Home, Grace House and Guiding Hospice for their love and care. A visitation will be held on Thursday, July 6 from 5:00-7:00 p.m. at Weed-Corley-Fish Funeral Home, 3125 North Lamar, with a private family graveside service at Grace Hill Cemetery, Perry, Oklahoma. In lieu of flowers, the family requests that donations be made to the Oklahoma Medical Research Foundation or the charity of your choice.